We — an enterprise within the range wholesale with fruits in the area Burgenland and Vienna — present to you our company on the following pages as an efficient partner for fresh and exotic fruits from around the globe. We invite you to get impression of our enterprise, as well as its emergence and development in the past. Find our locations and become acquainted with you our members of staff and their areas of expertese. Inform yourself about our rich assortment of fresh fruits and vegetables. 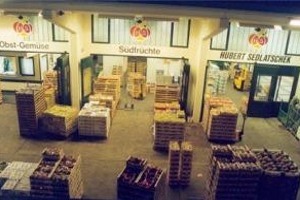 Whether you are interested in strawberries from Burgenland, Styrian apples, Italian grapes, Spanish oranges or bananas from Costa Rica — we have best contacts to domestic and foreign producers on the one hand, as well as to the traders in the most important European commercial centres on the other hand. Get an overview of our European-wide activities. Our purchasers with their trucks are personally present several times weekly on the most important Northern Italian and Southern French wholesale markets and are therefore best informed about availability, quality and prices.